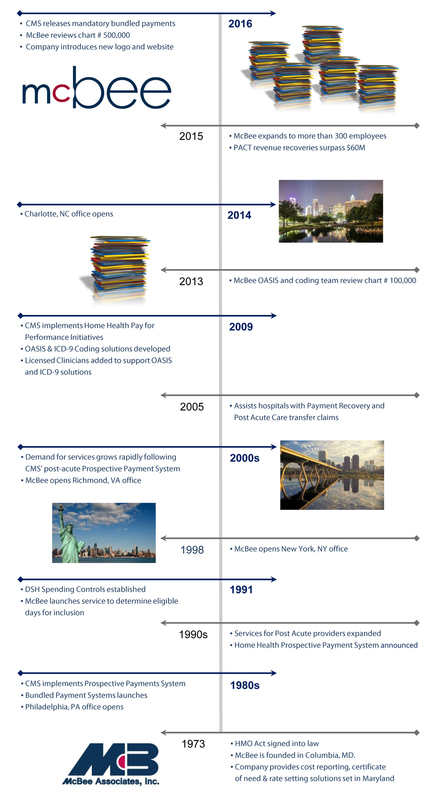 A rich, 40 year history working across the health care industry. So far, we’ve resolved challenges for more than 3,800 acute and post acute providers. "We have been working with McBee for more than 18 years on our bundled payments initiatives. Their system tracks profit and loss on a case level, and establishes meaningful benchmarks so we can easily judge the success of our program. We feel confident knowing we have experts who understand the full continuum of care on our side for the upcoming CCJR model." We are an industry leading, premier health care professional services firm who partners with our clients to consistently deliver meaningful insights, solutions and sustainable results. We believe our innovative solutions provide the critical knowledge to move providers forward in the health care industry. Helping shape the way the health care industry and its providers evolve is the value that we provide to our clients, employees and the communities where we live and work. Our values guide us, inspire us, and drive us to do the right thing. Individually, we live them. As a company, we measure our success by them. McBee was founded in 1973, and since then we’ve stayed true to one core belief: The success of our clients is paramount. That unwavering dedication, backed by know-how and hard work has made us one of the largest, well regarded independent health care-focused consulting firms in the country. We’ve worked hard to earn both our reputation and the trust of acute and post-acute providers of all sizes, including Fortune 500s, major for-profit and not-for-profit chains, health systems, and independent providers. Our commitment to achieve the best outcome has helped us retain a number of clients for five, 10 and even 25 years. By providing services that are focused exclusively in the health care industry, McBee is able to concentrate on developing and maintaining expertise, techniques, and a level of understanding of health care finance and operational management that is unmatched in the industry. To find a permanent solution to issues and challenges, we use time-proven processes, and brilliant people armed with enabling technologies that fit seamlessly within the client’s culture. We discover real opportunities for improvement by placing the emphasis on information analysis as opposed to information processing. We’ve been in business for more than four decades. Here are some milestones we’ve hit along the way. We’re building the careers of the next generation of industry leaders. Are you a fit? Visit our Careers page.